Passed away peacefully on 2nd April 2019. 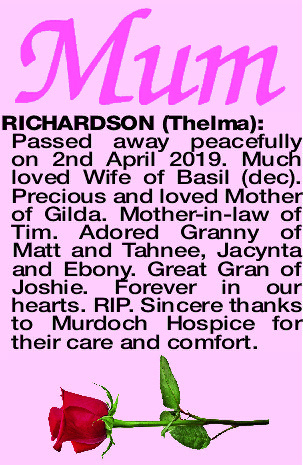 Much loved Wife of Basil (dec). Precious and loved Mother of Gilda. Mother-in-law of Tim. Adored Granny of Matt and Tahnee, Jacynta and Ebony. Great Gran of Joshie. Forever in our hearts. RIP. Sincere thanks to Murdoch Hospice for their care and comfort.